You should know that there are three battery cells provide power for Reuleaux DNA200, they can provide 11.1 volts in total. DNA200 is the first mod that features reverse polarity protection. This protection mechanism utilizes the standardized “sunken gap” round the positive portion of 18650 batteries. A little protecting ring indexes into this house that permits the positive battery contact to recess into position. If the battery is reversed the ring can stop the negative portion of the battery from contacting the incorrect terminal. 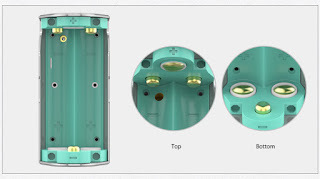 Within the incorrect battery orientation the Reuleaux can merely not perform. Truly, the Reuleaux has been rigorously thought of before being prototyped, abundant less move into production. I need a battery sled for a rx200... how can I get one?? ?